Ten steps to an easy Christmas planner? You bet ... with this new tutorial from the Under the Sycamore blog! Written as a guest post by three sisters, bloggers from eighteen25, this illustrated tutorial will take you step by step through creating a pretty Christmas planner. A bonus: free printable labels and decor elements to spark your project! Start with a simple composition book, then layer patterned paper, cardstock and labels to create a custom cover. 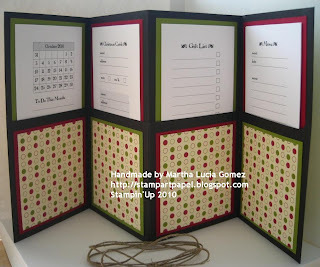 With inset calendars, dividers and tags, this is a pretty--and practical--planner project.